The moment we have all been waiting for has arrived, the human evolution module. 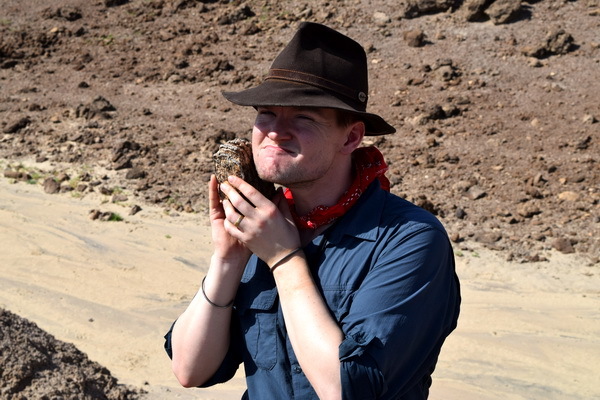 For the module, Dr. Matthew Borths from the University of Ohio joins us to tell the story of our own evolutionary origins. 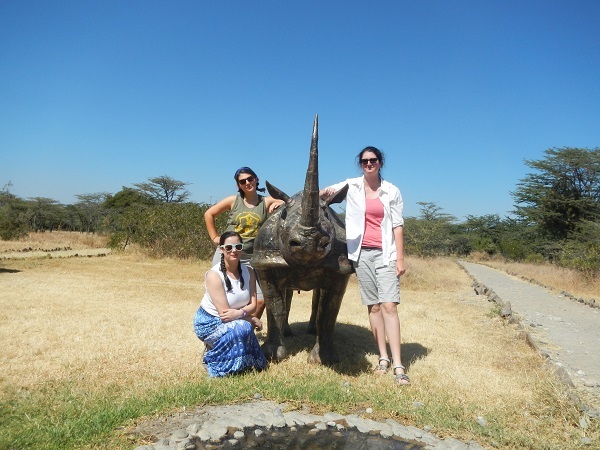 Dr. Borths studies changes in African ecosystems, particularly as they relate to ape evolution, throughout the Miocene. 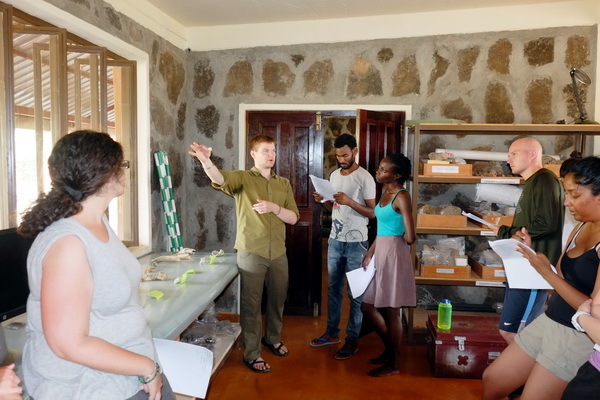 He was also the graduate teaching assistant for the Origins field school in spring 2013! Dr. Matthew Borths, giving a lecture in the TBI lab. Photo credit Deming Yang. To begin the story of human origins, we must first start at the evolution of primates, the order in which we belong to. Primates, in general, are characterized by a suite of features including larger brains, forward facing eyes, shorter snouts, long grasping fingers and toes and an opposable big toe. The first true primates existed over 50 million years ago during a period of time called the Eocene. These primates featured much more primitive characteristics than what we see today in us and modern apes. 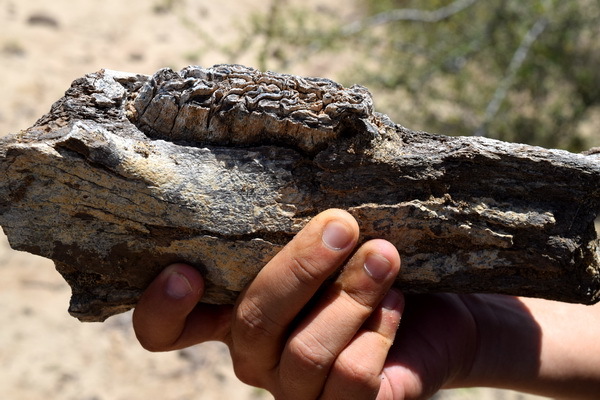 For example, they lacked complete closure behind the eye (postorbital closure), a fused mandible, and an ear canal, and featured both an extra tooth and a tail. However, as the climate began a period of warming late in the Oligocene (time period between 34Ma-23Ma), the first apes appeared. One of these early apes is called Proconsul, which is dated to 20Ma. Proconsul, meaning “before Consul” was found in 1909 at Rusinga Island, Kenya and was distinctive in its ape like characters. In fact, it was actually named after Consul, a chimpanzee in the London Zoo. This animal lacked a tail, which is a feature that is shared by all apes. However, Proconsul and other early apes appear to be arboreal quadrupeds (meaning they walk on all fours in the trees), which is a way of locomotion that is lost in all modern apes. 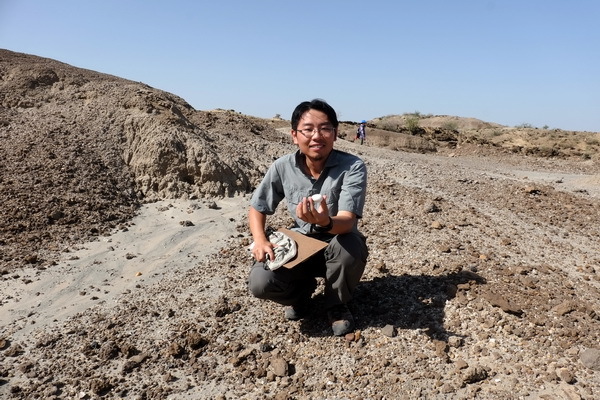 However, this fossil can give us insight into the features of our own last common ancestors with other apes. 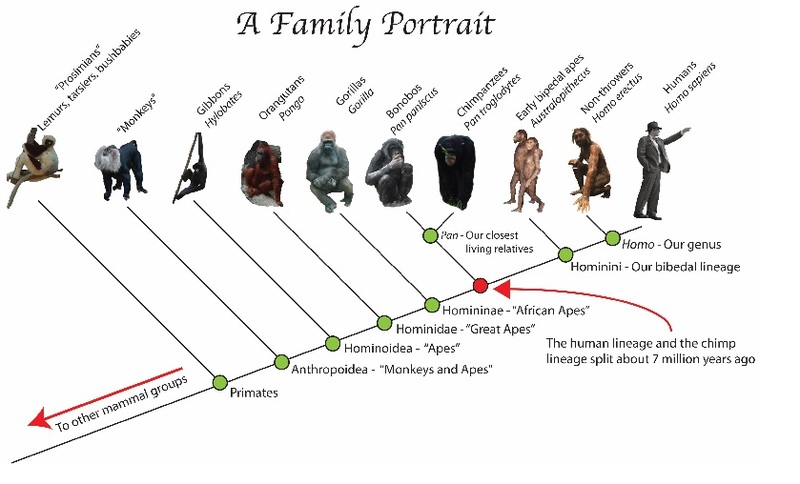 “A family portrait” of ape evolution. Courtesy of Matthew Borths. However, before we can start talking about how our lineage evolved from our last common ancestor with chimpanzees, it is vital that we understand our own anatomy so we can track how it has changed over time. For this students headed into the lab to review human anatomy. Professor Borths reviewing parts of the human skeleton with the students. Photo credit Deming Yang. 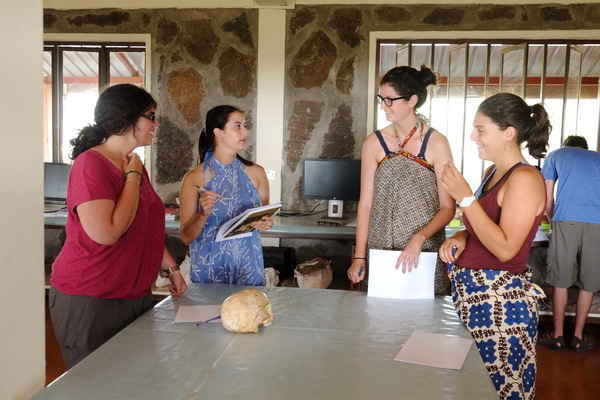 Jessica, Maria, Izzy and Leah working together to figure out the different bones that make up the skull! Photo credit Deming Yang. 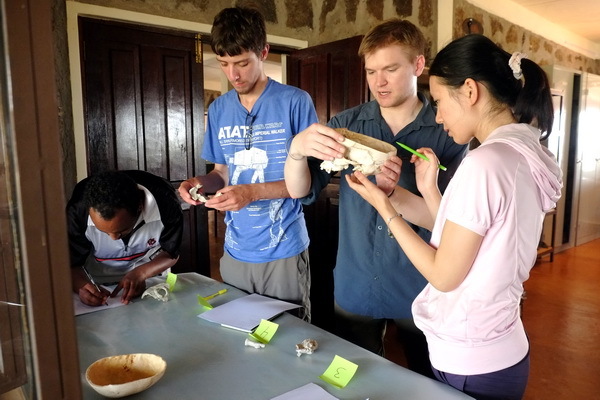 Tom sharing his osteological knowledge with fellow students Felix and Goitom during a bone identification practical in the lab. Photo credit Deming Yang. 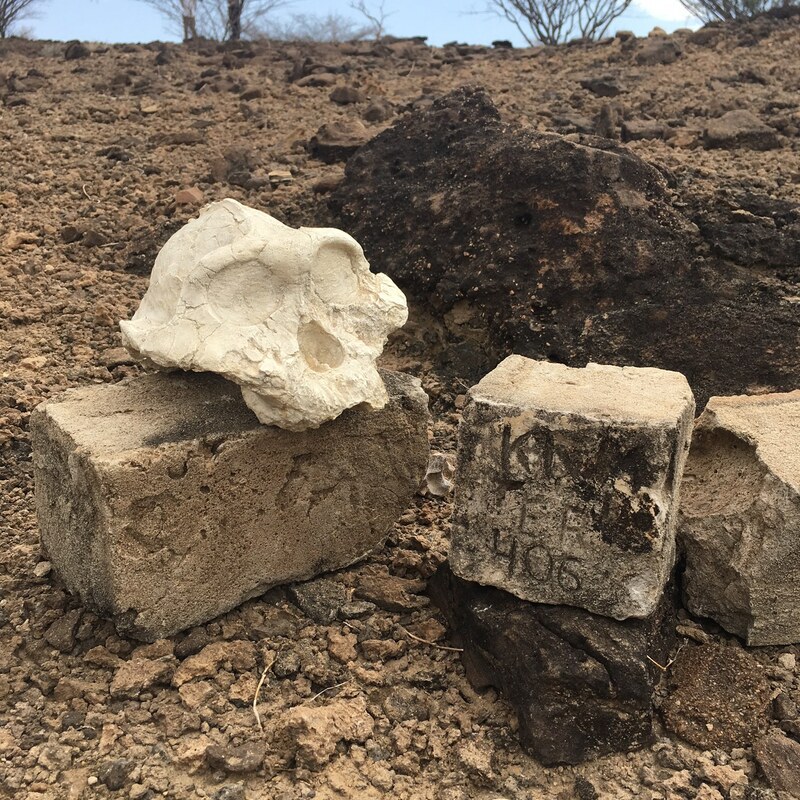 Knowing human osteology is crucial to the understanding of human evolution because the position and shape of our bones determines the way in which we function. 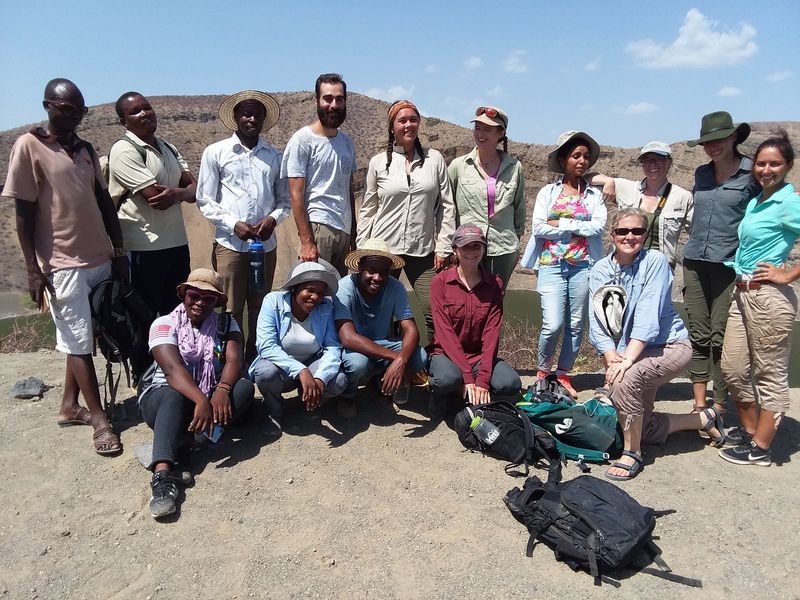 Even though the hominin fossil record is fragmentary and far from complete, we can make educated inferences from the features on the fossils we have found about how different traits have changed throughout time to make us who we are. For example, much of our fossil record is comprised of teeth. Just from looking at how size and shape of the teeth have changed over time, we can infer how diet has corresponded to these changes. Professor Borths showing Yishan where you can see the imprint of the confluence of sinuses in the occipital bone of the skull. Photo credit Deming Yang. 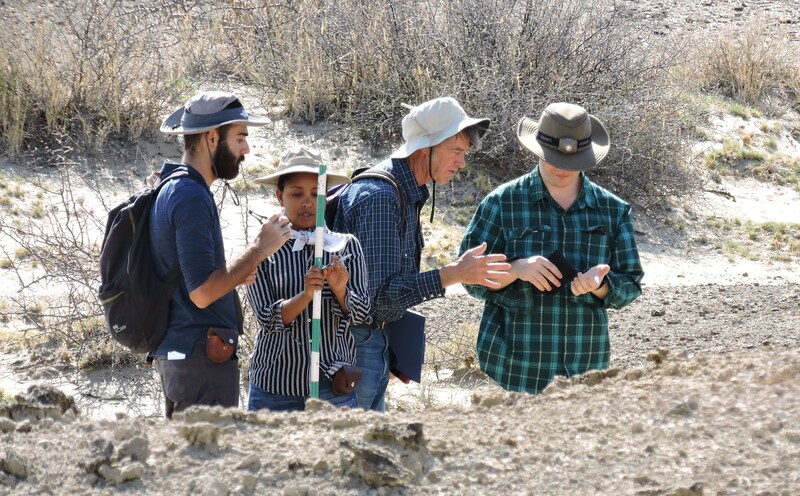 After the intensive osteology training, students took to the field in areas where hominins have been found before. 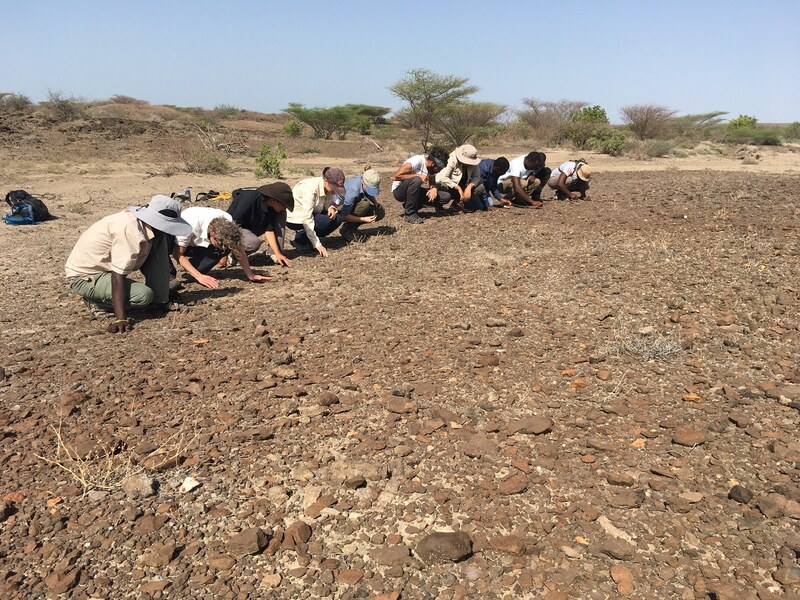 While we did not find any ancient humans, the students were able to stop by a hominin footprint site right here in Ileret on our way out to the field. 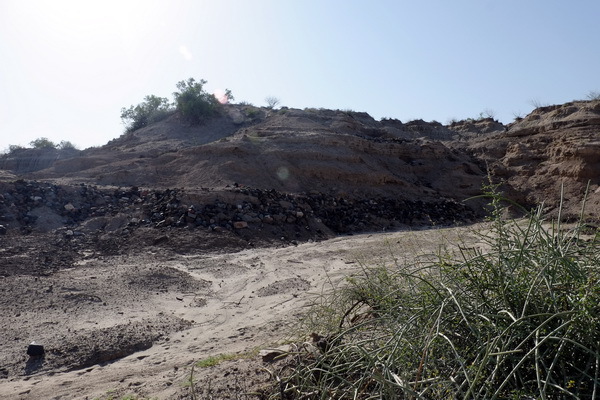 This footprint site is dated to be 1.5 million years old and was likely made by a Homo erectus (a primitive human). Also, from the shape of the footprints, it has been hypothesized that this ancient hominin essentially had a modern human bipedal walking gait. The footprint site we passed by on our way into the field. Photo credit Deming Yang. 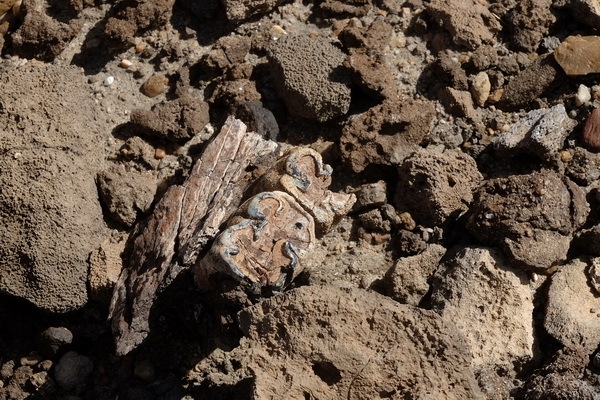 While no hominins were found on our field outings, we did have many other interesting discoveries. 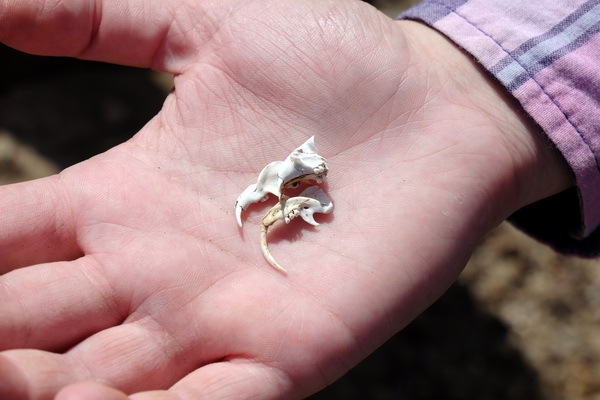 Amanda found a naked mole rat mandible and partial cranium! Notice how much longer one incisor is than the other… aka no wonder it died. Photo credit Deming Yang. A giant 1.5 million year old pig! Photo credit Matthew Borths. 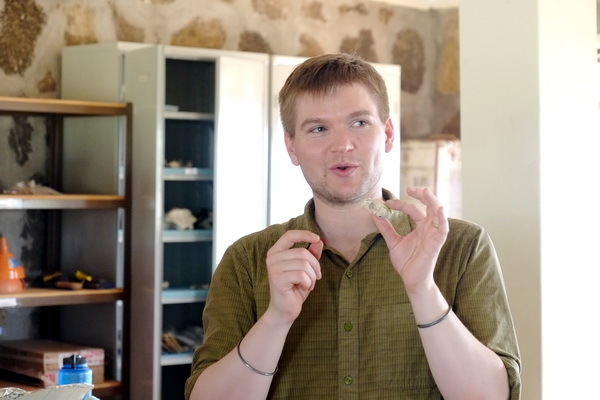 Professor Borths wishing he had ancient elephant teeth! Photo credit Laura Morrissey. 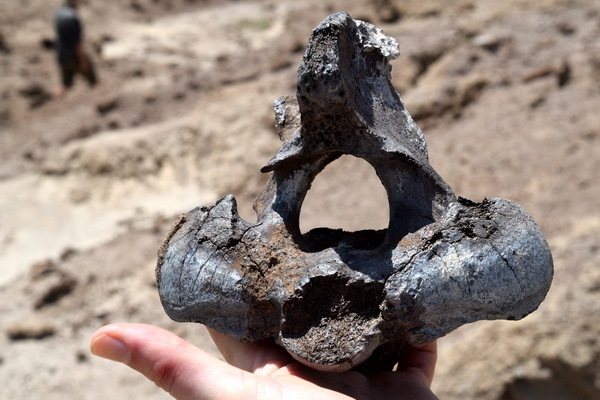 Students found a fossilized cervical (neck) vertebrae while in the field. Photo credit Matthew Borths. Hey that’s not a fossil! TA Deming showing off a bird egg he found in the field. Photo credit Laura Morrissey. 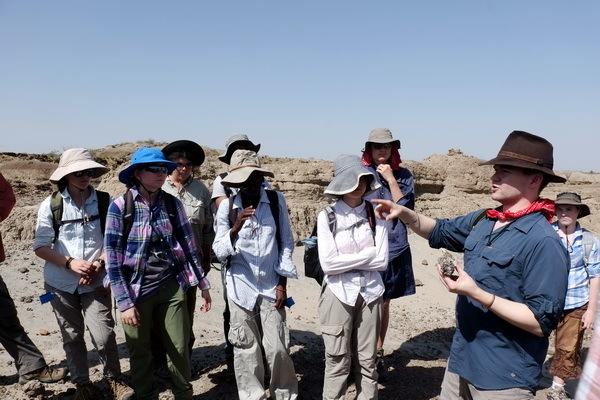 Students eager to learn more about their fossil discoveries from Professor Borths. Photo credit Deming Yang. 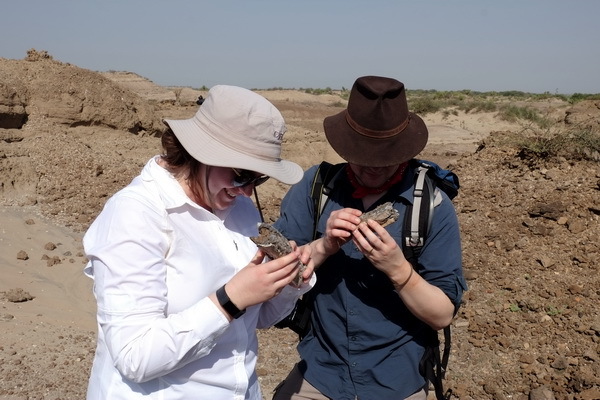 Director Hilary and Professor Borths excited to find an ancient crocodile jaw. Photo credit Deming Yang. 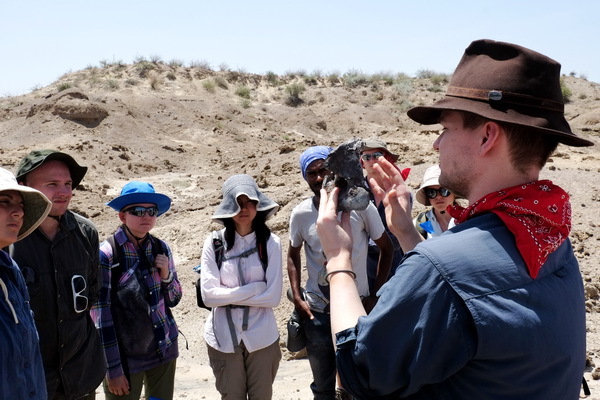 Learning in the field beats a classroom lecture any day. Photo credit Deming Yang. 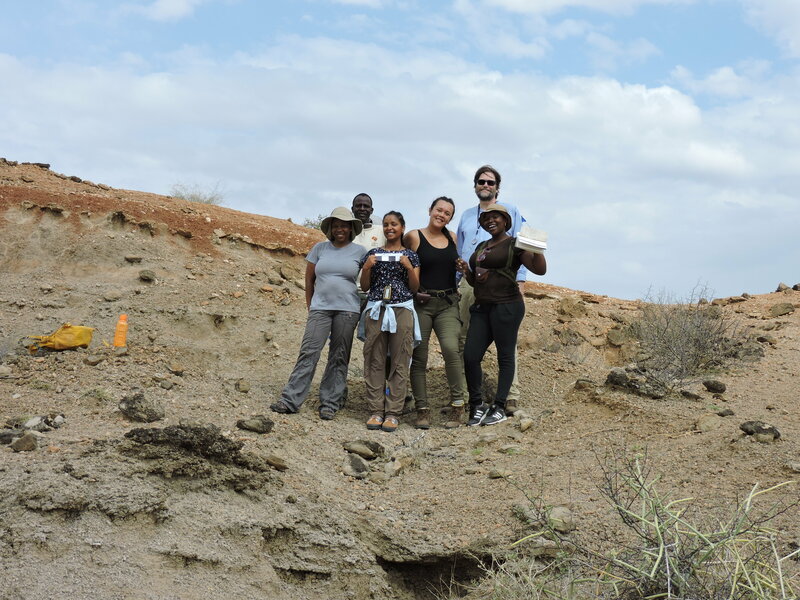 The students are excited to learn about our origins in a place with such a rich history of hominin discoveries. Stay tuned to learn about how phylogeny, which portrays the evolutionary relationships between species, is constructed and how the students applied this knowledge to our own evolution!